Today’s post is a pattern by guest designer Cheri from Ohio. Front Post Double Crochet (fpdc): yo (yarn over) your hook; starting from the front, place hook from front to back to front (as per arrow in example) around the post of st (stitch) in row below; complete as a dc (double crochet). This is pretty "stretchy". If you want a smaller headband, decrease original chain loop in multiples of 2 stitches. If you want a bigger headband, add chains in multiple of 2 stitches. Total number of rounds also depends on how wide you want your headband. You can make it one solid color, or stripes. 7 or 8 rounds. Color A - 2 rounds. Ch 70 Making sure you do NOT twist the chain, join with a ss to form a loop. ROUND 2: Ch 3 fpdc around first dc, *bpdc around next dc, fpdc around next dc. Work from * around. Ss in top of ch 3 to join. Repeat Round 2, changing colors when completing the number of rounds for your pattern. After last round and last ss, cut yarn, pull tight and weave in the ends. Love the ear warmer pattern- fast, easy and economical. This will look terrific done in my Alma Mater's colors of Scarlet and Gray - go Bucks! Sorry, you know an Ohio State alum can't pass on this. lol! Great design, thanks. 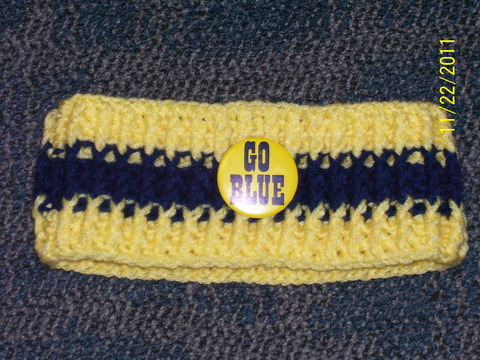 This is one of the best head/ear warmer patters that I have seen, it is truly fast and easy to make. I love this pattern, so many different color combinations to do. Keep up the excellent work. I'd like to decrease width in the back. How would I do this with this type of stitch ? Would I need to switch to dbl cr or sc for several rows 1st? Perhaps you can find a pattern that better fits your needs. Lots easier to do that than trying to modify this one. I did a modification to have it narrower in back, and it worked really well. Depending on how narrow you want it to be, do the first one or two rounds normally. After that, about four inches from the end, I did a hdc, then slip-stitched up until one stitch before the join, then a hdc again, and join to beginning part of previous row with ss. Continue normally. Keep repeating that for the additional rounds. You end up with a narrower strip in back that will fit under long hair. Exactly how long that narrow part will be is up to your choice, really. About four inches worked for me, but could be a bit more for someone whose hair is really thick. I've already given mine away as a gift, so don't have pictures. Hope this verbal explanation is enough.